It’s not like it’s a complicated bathroom. It’s a straight rip out, reinstall stuff in exactly the same spot only new. Yes, we did discover that the floor waste wasn’t at the lowest point in the room and just emptied under the house anyway, and we did need to cut the giant architrave around the window to accommodate the shower screen. But why does it feel like this may be the first bathroom this team has ever done? I get that there’s a lot of tradesmen involved. I’ve met Terry, Stu, Andrew, John, Sam and Alfio. I didn’t quite catch the names of the demolition team, but I think they were both called Scott. And Crystal, the site supervisor, has popped off for a week’s holiday, the slacker, so that doesn’t help. But I’m up to my fourth schedule version in this three week job. They’re not even bothering writing them down any more. At least today’s revision involved an acceleration. I was expecting the carpenter, he was the one finally tasked to remove the window architrave after the demolition Scotts and the renderer passed on it. He actually arrived in the expected window between seven and seven thirty this morning. “Where’s the plumber?” he asked. What an excellent question. 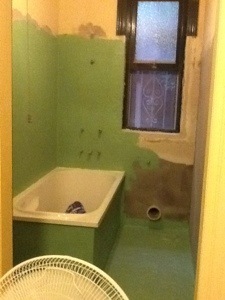 He was supposed to be here too, putting in the bath so the carpenter could build a frame around it. Fortunately he appeared while I was dropping off kids. “Where’s the bath waste?” he asked. It was a day for excellent questions. A text to Tony the bathroom supply chap brought it by express delivery half an hour too late. They managed to insert it anyway. I was just stepping out of the house for a delightful lunch with friends when my mobile rang. It was Sam the tiler. “I’ll be there in half an hour” he said, not on Saturday as advertised. I put the keys in the tiny safe attached to the front door and advised him of the code. I arrived home to the distinctive smell of polymers cross linking. It’s been a while, so I can’t pick the exact chemicals, but I’m feeling like its an acrylate of some sort. I’ll have to check with the husband, he’s the one with the PhD in polymer chemistry. Anyway, he’s put a fan in front of the bathroom to help dry it and to push the pong out the denuded bathroom window. “Where’s the tiles?” he asked. I knew that one, out on the back verandah. “Ah yes, but where is the capping?” Cursing a little, I texted Tony again. “Where’s the capping tiles?” I texted. “And also, peeping into Chapter 2, is the vanity ready?”. Trying to preempt further snappy texts next week. It’ll be arriving tomorrow lunchtime. I wonder if it would have without any nifty phone work? As I farewelled Sam, he paused to criticise the key safe. “Three digits no good”, he opined. “Any teenager, half an hour to get into it. Four digit much better.” I removed the keys from it immediately. That’ll show those teenagers. I thought it prudent to close the dogs out of this bit of the house. I can just see them both up to their furry little ankles stuck in the waterproofing. I have enough going on without having to call in a dog extractor.